There are three types of garage door openers typically used in the residential garage door world. 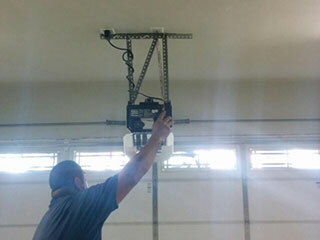 They are the screw drive garage door opener, the chain drive and the belt drive door openers. Each requires a certain type of maintenance to keep them running at their best. Many experts say that the screw drive machines are the easiest to maintain and the hardest to break because they have the fewest parts. For the at-home care of these openers, regular application of grease is sufficient, but they are more sensitive to changes in weather than other garage door openers. The basic design of a screw drive opener is that of a bolt which turns and pulls the door up with it. The motor is usually in ½ or ¾ horsepower, and is fairly quiet and fairly fast, but not normally exceptional at either. The greatest advantage the screw drive opener offers over the other types of openers in terms of garage door opener maintenance is that they have very few parts, and no chains or belts which can break, so they are harder to damage. The most important maintenance step for a screw drive opener is the lubrication maintenance. When you can hear noises coming from the screw box or the movement seems less fluid than normal, that is a sign that it is time for a fresh application. Choose the lubricant carefully; it should be grease-based and appropriate for your type and model of opener. The lubricant should be applied no less than once per year but it is not necessary to completely bathe the screw in grease. A thorough, light coating will usually be sufficient to keep it running properly. Screw drive garage door openers are very sensitive to changes in weather. Lubrication can help prevent problems which develop during the cold weather months. If this becomes a problem for your machine, choose a lubricant which is designed to work in all weather conditions to compensate. The turning of the screw in the drive section can be affected by different weather patterns far more than the pull upon a belt or a chain, which is the reason they are often described as ‘difficult’ when the weather changes. Screw drives are highly favored for their ability to get the work done with very few parts and very simple maintenance. Yearly application of a lubricant to keep it turning quickly and quietly is enough for many of these openers, but drastic weather changes can take their toll and need to be accounted for.